A once-luxurious, now abandoned hotel in the Italian Alps. 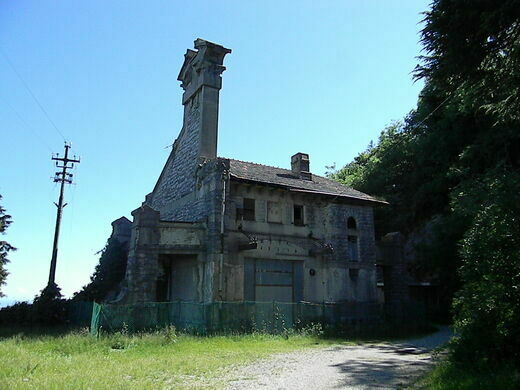 With all the charm of the Grand Budapest Hotel and the eerie emptiness of the Overlook Hotel, a once-grand hotel deteriorates on a mountaintop above Varese. Venice's island of the dead. The Pope’s secret escape route. 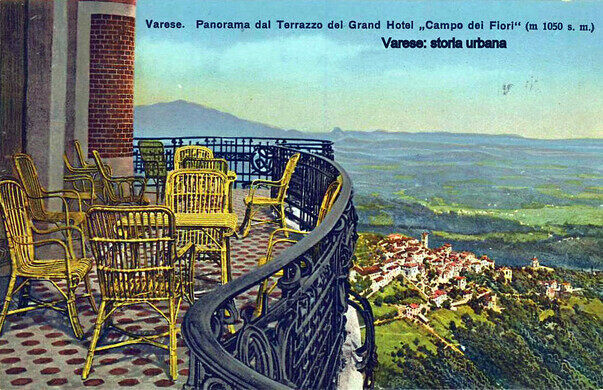 The Grand Hotel Campo dei Fiori was built a luxurious cousin to the smaller Palace Hotel in Varese in 1910, while tourism in Varese was on the rise. Its environs lent it an air of luxurious detachment from the world—in order to reach the mountaintop hotel, guests had to ride a steep funicular railroad. Eventually cable cars from Milan, Como, Lake Maggiore, and even from neighboring Switzerland would lead to the glamorous hotel. 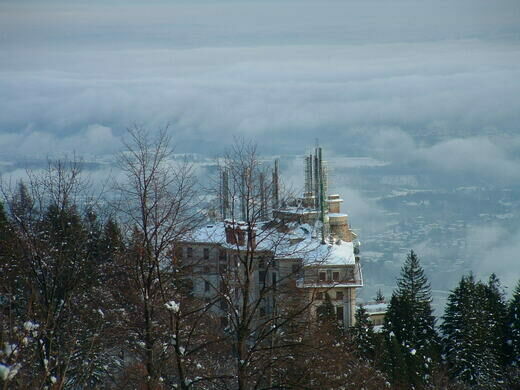 The hotel was designed by the famous art nouveau architect Giuseppe Sommaruga, and the scenery inside the rooms of the palatial building rivaled the mountain views outside. Wrought iron gargoyles adorned balconies, and winding garden pathways were lit by gas lamps. For its first decades of operation, the art nouveau-styled hotel was brimming with elite guests. 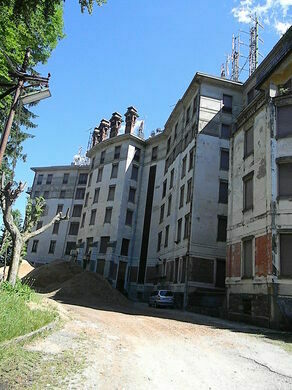 The first and second world wars dented business, but tourism in Varese mostly recovered. However, in the decades to come fewer and fewer people wanted to stay in the old hotel on the mountain. The hotel closed in 1968. 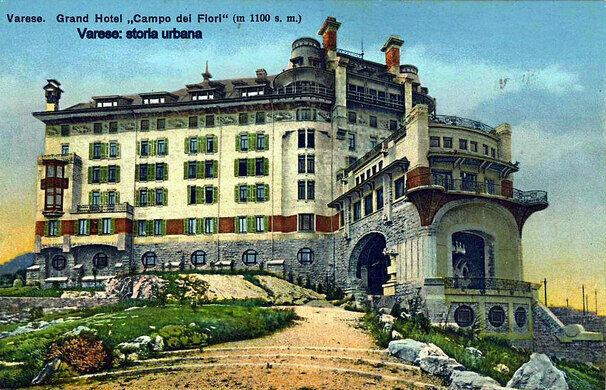 Despite various attempts to reopen it, the Grand Hotel Campo dei Fiori remained closed and mostly abandoned. In the 1980s, radio antennae were installed atop the roof of the historic building. This marred the appearance of the old hotel, but leasing out the rooftop allowed the owners to keep up with maintenance. The Castiglioni family owned the hotel until recently, and have employed caretakers over the years to maintain the building and its grounds. They and their families have the privilege of living alone in the 200-room hotel. Visitors must be content to gaze upon the hotel from the outside while hiking through the park, or to visit the hotel during the annual Feast of the Alpini, which celebrates Italy’s traditional mountaineers. In 2016 the Grand Campo Hotel dei Fiori was sold to a private group owned by a former politician. Though no plans have been released for the hotel’s redevelopment, the group has commented on the extensive work the building needs (it currently has no sewer system). Hopefully this will allow it to remain a gorgeous ruin for a little bit longer. For those unable to get to Varese, you’re still in luck: The hotel was a filming location for a 2017 remake of the 1977 horror classic Suspiria. This monastery built into a cliff hides a perfectly preserved hermit in a glass coffin. An unsettling painting of three faceless sisters that is surrounded by history and legend. The Sighignola summit on the Swiss border offers views so breathtaking it's been named one of the most beautiful places in Italy. For hundreds of years, this huge figure has been blessing visitors before they explore his body. 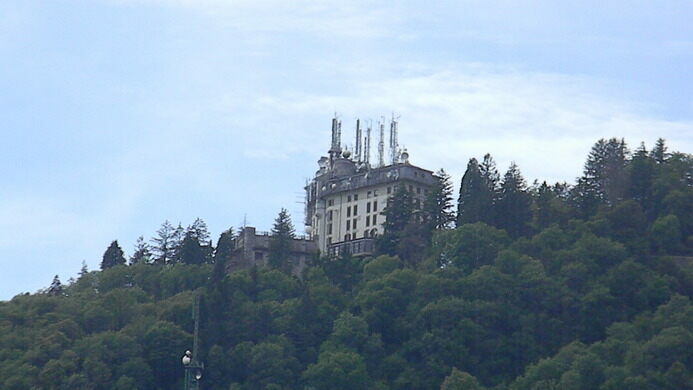 An abandoned Art Deco hotel nestled on the side of a wooded mountain. Crumbling ruins of the thermal baths that once attracted royals and aristocrats from throughout Europe. The ruins of a Florida miracle spring resort make it seem like a wonder that this was ever a health spa. The picturesque remains of an abandoned silver mine slope down to Tagish Lake in the Yukon.